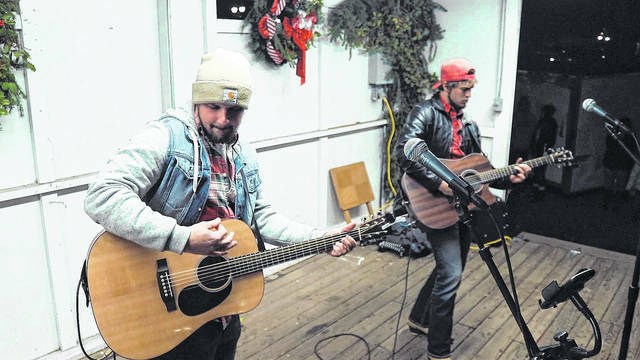 Devin Henry (left) and Jacob Lones performed “Fallin’ this Christmas” at the Gallipolis in Lights opening night event, which was featured in Henry’s recently released music video shot by Matt Brinker. GALLIPOLIS — Gallipolis In Lights at City Park was the inspiration for a new Christmas song and is featured in a music video – both pieces created by local artists utilizing local attractions and homegrown talent. Musician Devin Henry recently wrote a new song “Fallin’ this Christmas”, which was heavily inspired by his hometown of Gallipolis. Henry grew up listening to Christmas music, which he says his mother would start playing the first day of November every year (both his parents are from Point Pleasant, W.Va.). Having a passion for music and the holiday season, Henry sought to write a song about Christmas that was well received and not a cliche. Henry is an aspiring musician, pursuing his hobby and sharing his music with others. A graduate of Gallia Academy, he currently attends Otterbein University and is studying to be a nurse. He hopes to share his music with more people. While not his first music video, it is his first at this level of production, thanks to local videographer Matt Brinker. Everything about the video is themed around Gallipolis and keeping it local. Brinker and Henry are both natives of Gallipolis and the video features Megan Wise as one of the actors. Wise, a former Miss Ohio USA, is from Gallipolis and currently teaches at Meigs Elementary. Almost all of the video shot was taken in the Gallipolis City Park featuring the lights and community. While the video shooting took about three days, planning and coordination took about a month and a half. Projects like these are important to the local economy because of the means of social media and communication, according to Brinker. He also explained that he felt the community is on the brink of growing substantially, and he wants to be a part of that. Henry is excited about his future, and how playing music will be a part of that, but for the present he is proud of his hometown and where he is from. “I’d like to thank the community for supporting my crazy process. Without the support of my hometown I wouldn’t be able to pursue this. I can always count on Gallia County,” said Henry.